The use of targeted killings with weapons like drone aircraft poses a growing challenge to the international rule of law, a UN official says. Philip Alston said that the US in particular was doing damage to rules designed to protect the right of life. Mr Alston, UN special rapporteur on extrajudicial killings, feared a "Playstation" mentality could develop. His report to the UN Human Rights Council also brings renewed scrutiny of Israel and Russia. Both nations are also reported to have carried out targeted killings of alleged militants and insurgents. 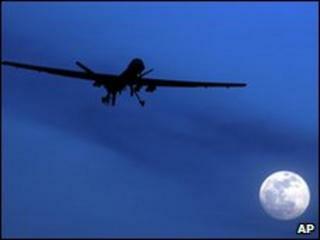 President Barack Obama has increased the use of Predator drones to attack militants in Pakistan. The UN report comes days after the US hailed news of the death of Sheikh Sa'id al-Masri, al-Qaeda's third in command in Pakistan, who was reportedly killed by a drone strike in May, along with his family. Mr Alston reserves particular criticism for CIA-directed drone attacks, which he said had resulted in the deaths of "many hundreds" of civilians. "Intelligence agencies, which by definition are determined to remain unaccountable except to their own paymasters, have no place in running programmes that kill people in other countries," the report says. Mr Alston also suggests that the drone killings carry a significant risk of becoming war crimes because intelligence agencies "do not generally operate within a framework which places appropriate emphasis upon ensuring compliance with international humanitarian law". And he adds: "Because operators are based thousands of miles away from the battlefield, and undertake operations entirely through computer screens and remote audio-feed, there is a risk of developing a 'Playstation' mentality to killing." In Mr Alston's view, there are circumstances in which targeted killings may be legal. But his report also expresses concern that the US has put forward what hedescribes as "a novel theory that there is a law of 9/11", enabling it to legally use force in the territory of other states as part of its inherent right to self-defence. This interpretation of the right to self-defence, he says, would "cause chaos" if invoked by other nations. BBC diplomatic correspondent Jonathan Marcus says that Mr Alston clearly believes that the rules of conflict need updating to encompass weapons that may strike a long way away from any traditional definition of the battlefield. However, some security analysts are concerned that this could jeopardise highly sensitive counter-terrorism operations. Michael Boyle, a lecturer in strategic studies at the University of St Andrews, Scotland, was quoted by the Associated Press news agency as saying: "The drones programme is effective in terms of getting terrorist operatives in places where there's limited reach or where, if you were to do it any other way, the political cost or the human cost would be too high."